Now you can subscribe to a mail newsletter with links to news about podcasting. I started this list because I come across links that would be of interest to people who care about podcasting. Now there's an easy way to share them with Podcatch users. 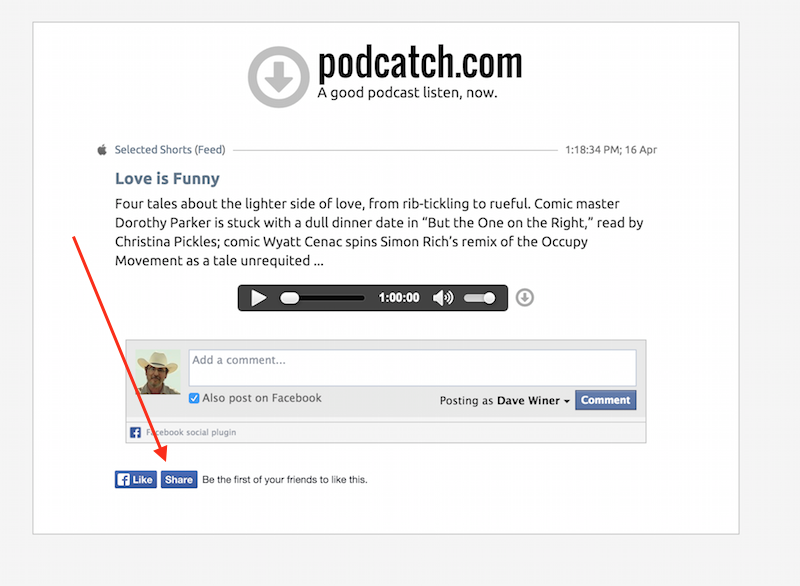 On Podcatch.com, here's how you share with a friend on Facebook. Click on the comment icon below the description of the podcast. The landing page for the podcast will appear. At the bottom of the page there's a Share link. Click it. A Facebook sharing dialog will appear. Choose to share it with your friend's timeline. The comment icon now includes a count of the comments you'll see if you click on the icon, taking you to the landing page for the podcast. By Dave Winer, Thursday, May 21, 2015 at 1:17 PM.